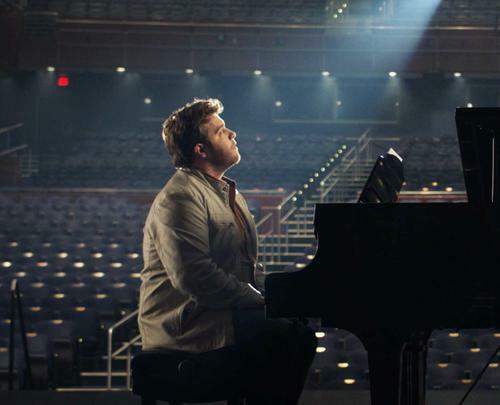 A film based on an inspirational hit song didn’t seem to have enough material for a full-length feature, however the story behind how the song came about, is both interesting and touching. The best selling Christian single of all time by rock band Mercy Me, written by lead singer Bart Millard ( J. Michael Finley) in the back of their tour bus, is a culmination of feelings from a son coming to terms with his abusive father. Bart lived alone with his dad when his mother left their home one day and never returned. Arthur (Dennis Quaid) is a bitter man who beat and belittled his son until Bart left after high school to join a Christian band. The band plays smaller venues and auditions for record producers looking for their big break. All the time Bart is told that the songs he writes aren’t moving or heartfelt enough to get them into the big time. Holding in a lifetime of hurt, and believing that as his father told him his whole life, that he’s “he’s not good enough,” he realizes he has to confront his dad so he can move on. When he returns home, he discovers that Arthur has terminal cancer, and has found God and turned his life around. The reconciliation that follows is the premise of Brad’s hit song. Finley, a Broadway actor, making his film debut, is a pretty good actor, not to mention that he can really sell a song. Quaid is terrific as the harsh, mean, unapologetic man. It’s an inspirational, good faith-based film, and because of its wonderful music and good performances, should appeal to a large audience. MPAA Rating: Rated PG for thematic elements including some violence.